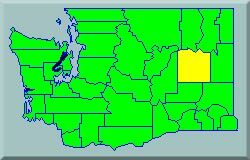 Lincoln County, located in eastern Washington State, has 2,310 square miles of mostly gently rolling hills. Bordered on the north by the Spokane River and Lake Roosevelt, the predominately agricultural land is interrupted by “pot holes” and channeled scablands scoured out by the Great Ice Age flood 18,000 to 20,000 years ago. With a semi-arid climate, recreationists can enjoy our 4 distinct seasons and a variety of activities. Small friendly towns provide tourists & visitors with amenities and an opportunity to slow down and enjoy a gentle pace of life. Festivals and fairs ensure plenty of action, from rodeos to dirt bike races. Antique stores, quilt shops, music and theater events, and uncrowded golf courses await. Lake Roosevelt and a collection of large and small lakes, and streams afford multiple options for boating, camping, and fishing. Over 131,229 acres of public lands are accessible for hiking, hunting, fishing, or photography. We hope your virtual tour brings you to Lincoln County for a reality visit soon! EmailStreet Address: 303 6th St.
2,311 square miles, including 205.5 square miles of Public Lands.